Pripyat was once a model city of the Soviet government and was built in 1970 for the workers of the nuclear power plant, situated just three kilometers away. The average age of the city inhabitants was, at the time of the accident, only 25 years. Pripyat had all the luxuries of a modern city – a railway station, port, hospital and a fairground. During the evacuation women and children were collected first, but there was a serious lack of buses in this part of the Soviet Union. 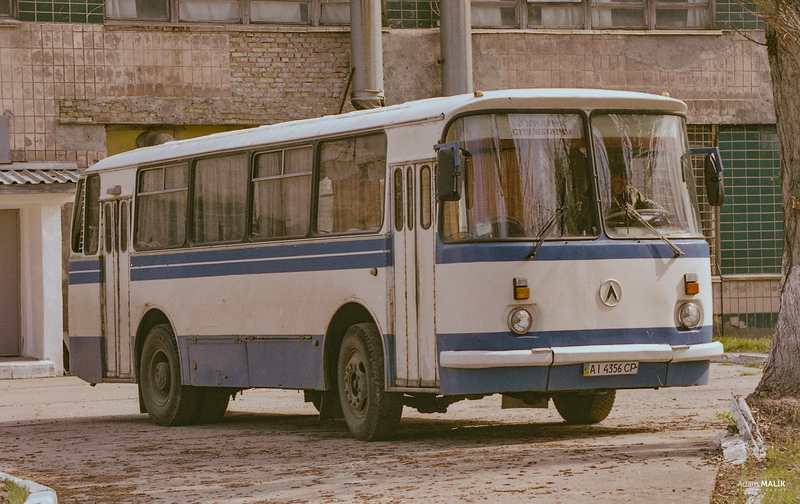 The buses thus had to come from other parts of the country to evacuate all 50,000 inhabitants of Pripyat. The queue for the buses was 25 kilometers long – which means that when the first bus was leaving Pripyat, the last bus couldn’t even see the power plant chimney. In less than three hours the city was empty, and it will remain empty forever. During the evacuation, the people of Pripyat were not allowed to take pets or cattle with them, due to the fact that these animals would have been contaminated with radioactive dust, carrying it in their fur and from grazing on the land. Special Forces teams were set up to hunt and kill all wild animals in the Exclusion Zone. On May 5th 1986, the evacuation of people living in the exclusion zone (30 km radius around Chernobyl) took place. Today, the zone is forbidden for people to enter, with the exception of ex-residents visiting cemeteries or those with a permit. Around 150 people (mostly pensioners) live in this exclusion zone and all are living here at their own risk. Apart from these inhabitants, there are also around 3 000 workers who are under a special regime and take care of the Chernobyl zone itself. The same quantities of workers are still working at the Chernobyl power plant, even though it has been completely shut-down since year 2000. Besides liquidating the nuclear fuel, these workers also continue with the construction and maintaining of the new sarcophagus, which was completed back in 2017. Pripyat is now a city of ghosts and despite being empty; it has its own grace and atmosphere. Pripyat did not end up like the nearby villages which were buried under the ground by bulldozers. The villages are only commemorated by boards on the road with their names and a village map. Pripyat, as well as the whole 30-kilometer restricted zone is guarded by the Police and Army. Despite this non-stop duty, it did not prevent robbery and plunder, mostly in 1991 after the Soviet Union dissolution when the Chernobyl zone was unwatched. The whole city of Pripyat is plundered and there isn’t a single flat that has not been visited by thieves, taking away all precious items to be found. A military factory (named Jupiter) had been operating in the city until 1997; today it is even more plundered and destroyed than the majority of flats or schools in the city. The city is full of contemporary (that is 1980s) writings, signs, books or pictures, most showing images and slogans of Lenin. Lenin’s statements and portraits are virtually everywhere – in the Palace of Culture, in the hotel, the hospital, at the police station, as well as in the schools and kindergarten. The walk around the city is like a trip back to the past, the only difference is that there’s not a single soul around, not even birds in the sky! One can only imagine the whole picture of the era when the city was booming. The whole city was built on a green field soon after the nuclear power plant was built. Everything is made out of concrete and the houses look the same as in any other city of the Soviet era. Some of these buildings have been overgrown with trees and are barely visible from the road. Chernobyl is a vital example of how Mother Nature can cope with the work of Man. In just over three decades remains only ruins of the city. There is no other place in the world such as this one.